What’s the difference between Essential and Elevated services? Elevated Manicure and Pedicure offer additional massage time and the treat of a hot paraffin wax mask that helps hydrate your skin. Elevated Facials offer either a Skeyndor or Quanessence treatment. Service times will vary especially since we are a school and all services are performed by students. We ask that you please keep this in mind when booking and have patience if we are running behind. You can view the approximate timing of all of our services online at this link. Our clinic hours may change due to timing of when our students are ready to perform services. You can view our hours at the bottom of this page. What time do you take your last appointment? Depends on when we close and which service(s) you are looking to book. If the service you want to book is 90 minutes long then you can book up to 90 minutes before we close. Approximate service times can be found at this link. Do you offer gel nails? Yes and no. Gel nail service is not part of our regular service offerings but we do post model calls several times during our Nail Technology program so ensure you’re on our mailing list and like our Facebook page to keep notified. All of our program pricing is found under each program page at this link. What are the advantages of going to a private college? When is your next intake date? All intake dates are posted on the relevant program page found at this link. What does purposely limited intakes mean? Some schools have intakes every couple of months however we feel we are able to better focus on each class by reducing the number of intakes per year to only 2 for our 10 month programs. What are my options for funding my education? What is your maximum number of students per class? Currently we limit our class sizes to between 10-15 students. This is contrary to some other schools that have twice our limit. Smaller class sizes means more individualized attention for our students. Can I make money painting nails? We do a whole lot more than painting nails. Estheticians are skilled in skincare, hair removal and nail care. We also have professional product knowledge and can give expert recommendations. We can work anywhere in the world and if skilled at a certain area, we can choose to go into a specialized field which can help generate a substantial revenue. Where can you go in this industry? Becoming a licensed beauty professional opens up a myriad of career choices around the world. From the obvious choices of hairstylist, esthetician or nail technician to industry sales rep, cruise ship spa/salon, business entrepreneur, educator, distributor, fashion show and more. If you are at a point in life where you aren’t sure what you want to do, this is an excellent skillset and license to have in your arsenal to allow you to work and make a great living either as a full-time career, while attending school for another passion or as a supplement to another career choice. b) Supply and Student Kits are non-refundable except where items are returned unopened or as issued no later than 5 business days after the end of student enrollment. c) 100% of tuition will be refunded in the event enrollment ends prior to the program start date. e) All refunds applicable will be paid within 30 days from end of enrolment. What is your Spa Satisfaction Policy? The staff and students at Elevate Beauty pride themselves on providing you with quality service and excellent customer care. We appreciate your support for this invaluable hands-on training that is vital in our student’s learning path. • Our menu prices are approximately 50% less than the industry standard for a licensed professional to account for students performing the services. • Consultations are offered free of charge and are highly recommended for first time clients. During the consultation, the instructor will provide the student the coaching required to decide what is best for your needs. • We do not issue refunds on services and by signing our client waiver form, you are confirming your consent that you are being worked on by a student where exact results cannot be guaranteed. • Should you have any questions or concerns about the service you have received at the school, please notify us within one business day of your service as this feedback is critical to the student’s learning. If you are not satisfied with the work performed, we will book a return appointment so that your service results can be visually inspected by the student and the instructor. At that time, we will make every effort to correct any problems to your satisfaction. Due to your initial service already being discounted because a student was performing the work, you may be charged a fee of up to 75% off the second service provided to correct the issue. Thank you for supporting our students by allowing them the opportunity to gain valuable practical experience. What is your Salon Satisfaction Policy? • Our menu prices are approximately 50% less than the industry standard for a licensed professional due to student performing all services. • Consultations for all hair services are offered free of charge and are highly recommended for first time clients and for chemical services. During the consultation, the instructor will provide the student the coaching required to decide what is best for your needs. Should there be any previous over-processing due to prior chemical services, heat damage or any other issues with your hair that may affect the outcome of your hair service, you will be made aware and provided recommendations before your service is started. • Should you have any questions or concerns about the service you have received at the school, please do notify us within one business day of your service as this feedback is critical to the student’s learning. If you are not satisfied with the work performed, we will book a return appointment so that your service results can be visually inspected by the student and the instructor. At that time, we will make every effort to correct any problems to your satisfaction. Due to your initial service already being discounted because a student was performing the work, you may be charged a fee of up to 75% off the second service provided to correct the issue. I am a mature student and have always wanted to be a hairstylist or esthetician but never had the chance. Is there a point when you are just too old to learn it? You are never too old to learn anything new, especially something you are interested in! Maturity and life experience will make you an even better salon or spa professional since it takes many life skills on top of job skills to be successful. Things like dependability, work ethic and and flexibility seem to come more natural as we age. 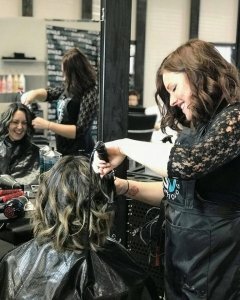 Trust that your unique experience and perspectives will be an asset on your journey toward becoming a great hairstylist or esthetician! First and foremost you need people skills. The desire to want to help people feel great. In addition, patience, time management and reliability are also key aspects of success. Talent can certainly help but we’re here to teach you the skill.